The body of a family member the former Qaddafi-era Benghazi governor has been found near Saloug, south-west of the city. 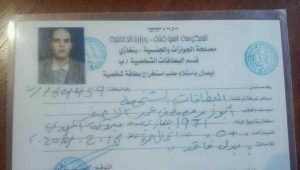 It is being reported that Abu Zeid Mustafa Al-Asfa, who was the brother of ex-city governor MohammedAbu Zeid, had only arrived in Benghazi four days before he vanished. The circumstances of his disappearance have not been made clear. Locals first discovered some luggage containing personal items and then later a wallet containing his ID. It is understood that later in the day his body was found. There is, as yet, no indication of the cause of Asfa’s death, nor who might have been responsible. His is latest in a number of abductions and murders in the city.